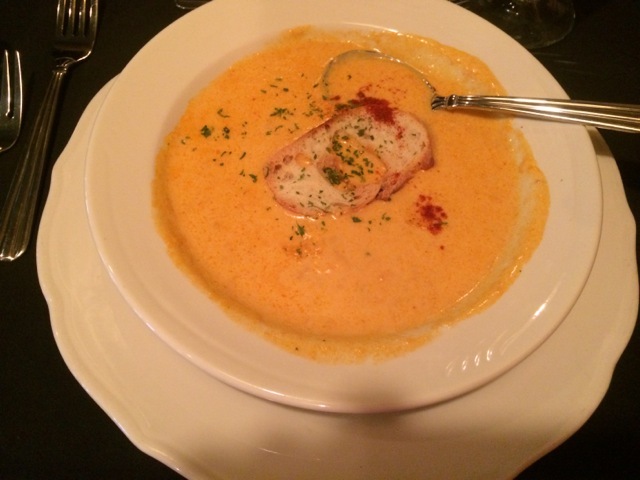 I would never have guessed tonight’s dinner in tiny Medora, North Dakota (population 131) would begin with a delicious bowl of lobster bisque. Just about as far from a lobster pound as one can get in the United States. Theodore’s Dining Room in the Rough Rider Hotel came as a savory surprise with cuisine comparable to most any urban upscale restaurant. Tables are draped with black and white cloths and neatly-folded burgundy napkins. Light sparkles off the crystal-clear wine glasses creating an elegant welcoming ambiance. On this chilly June evening the gas fireplace adds a comforting warmth. Our waiter, from Argentina, greeted us with a basket of warm bread, butter and goblets of ice water. After indulging in the rich lobster bisque I tackled a thick grilled Sioux City Sarsaparilla Bourbon glazed pork chop served on dirty rice along side fresh asparagus spears. Bob selected the popular Braised Buffalo Osso Bucco accompanied with horseradish cream, green beans, crushed potatoes and caramelized onions. An edible orchid adorned each entree. To complete our dinner we shared the sticky toffee dessert topped with vanilla ice cream and caramel sauce. 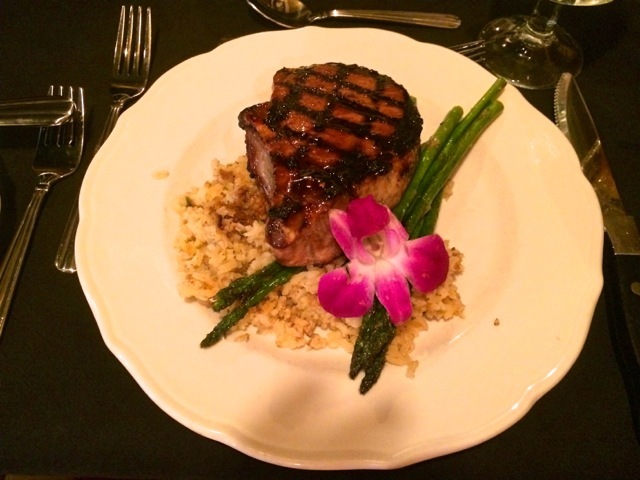 An overall positive meal with attentive, professional service. Quite a pleasant surprise – remote but worldly wise. For those with limited time, short attention span or physical limitations the Discovery Tour at Jewel Cave National Monument offers an introduction to the world’s third longest cave system. 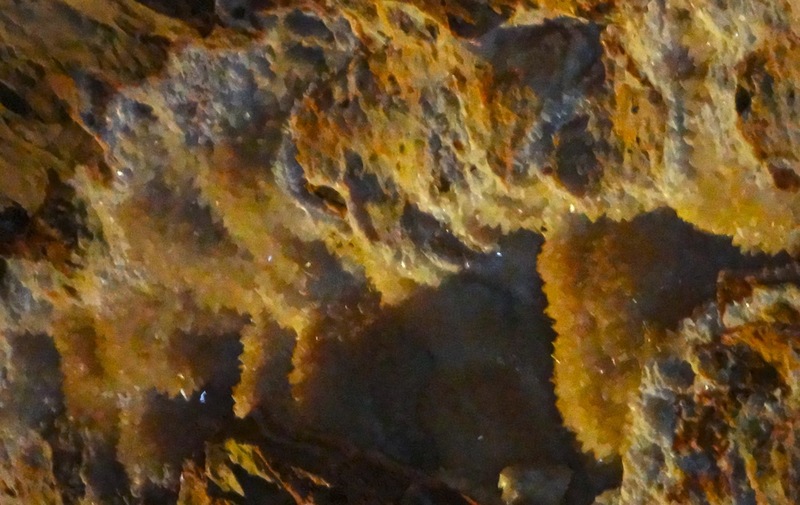 The 20 minute, ranger-led tour includes tales of the cave’s discovery and current exploration efforts plus a visit to the Target Room to see the “jewels” of Jewel Cave – two special calcite crystals known as dogtooth and nailhead spar. Descent 240-ft. below the surface and return is via elevator. Even wheelchairs can be accommodated on this tour. 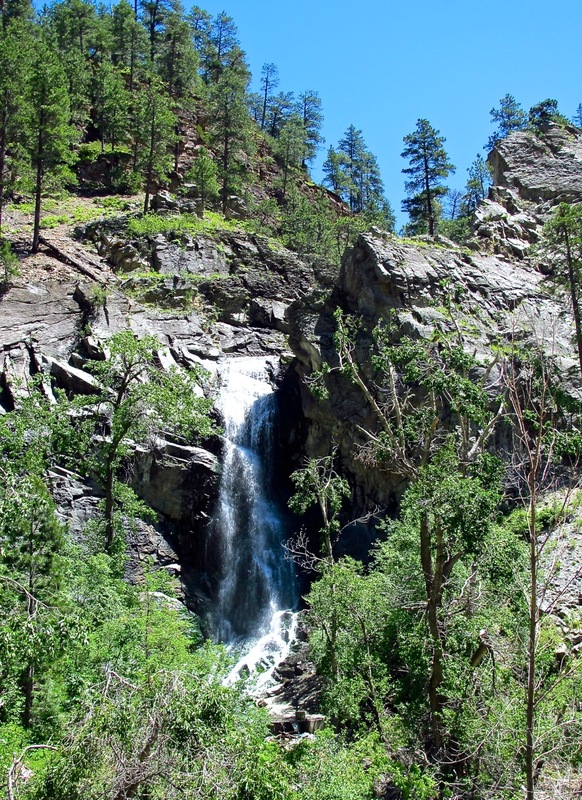 Other tours options are the moderately strenuous 80 minute Scenic Tour, a Historic Lantern Tour, and a 3-4 hour strenuous adventure on the Wild Caving Tour. I highly recommend the Historic Lantern Tour, we did this many years ago and our sons still remember the sense of adventure. 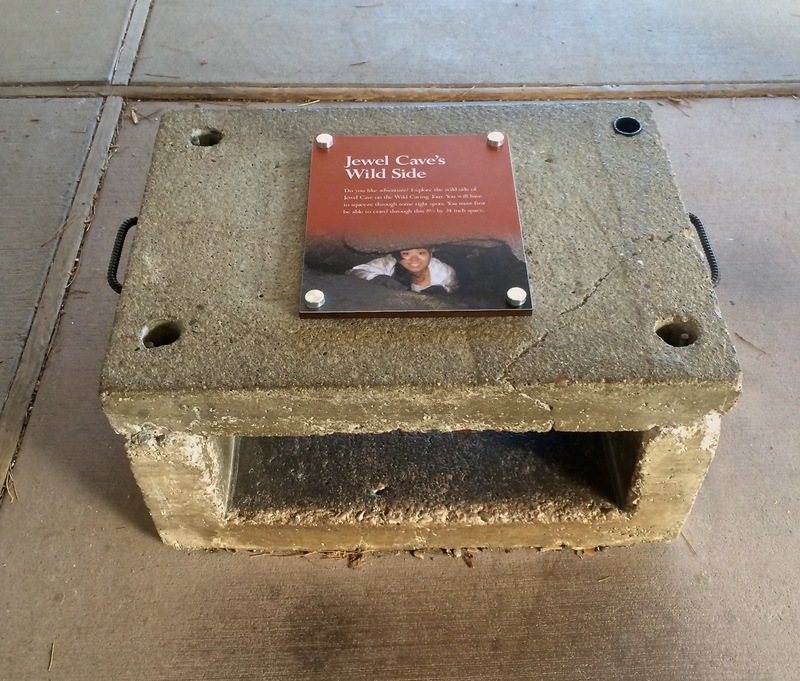 To qualify for the Wild Caving Tour one must fit through the space in this concrete block. It’s beyond my imagination to ever want to, not that there is any danger that I would pass the test. Jewel Cave Nt. Monument – 13 miles west of Custer, SD on US16, http://www.nps.gov/jeca/index. At cowboy poetry gatherings performers frequently recite the works of Badger Clark, South Dakota’s first poet laureate. His writings reflected the American West and were widely published during his lifetime: many have become legendary. Bob Dylan set Clark’s poem “A Border Affair” to music; the resulting “Spanish is The Loving Tongue” has been recorded by numerous artists through the decades. 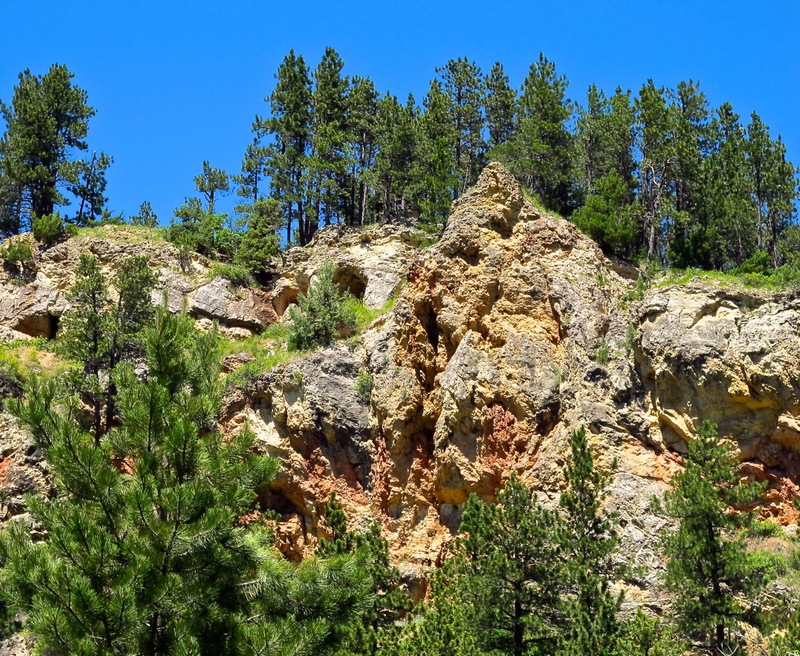 The cabin Clark built in his beloved South Dakota Black Hills is located within Custer State Park. Visitors find the secluded home, named Badger Hole, where Clark spent the last 30 years of his life a short drive down Badger Lane off US16A. 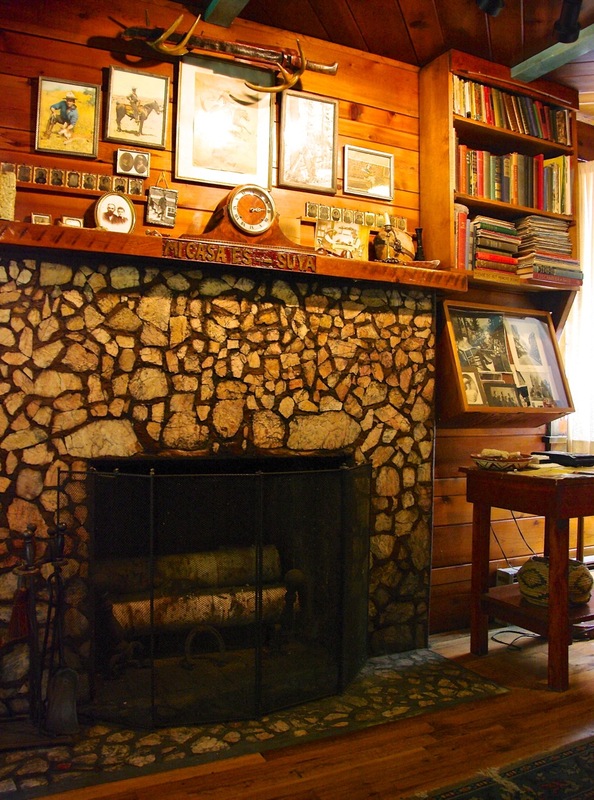 During the summer season volunteers give informal tours of the four room cabin much as Clark left it, complete with many of his furnishings, library and prized processions. The day we visited the volunteer was very knowledgable about Clark’s history and writings. She played recordings of Clark reciting some of his works just as he did throughout the United States when he spoke on “the circuit”. The next time I hear a Badger Clark poem recited I’ll picture Badger Hole in my mind, the natural beauty surrounding the cabin in the woods and the quiet solitude. 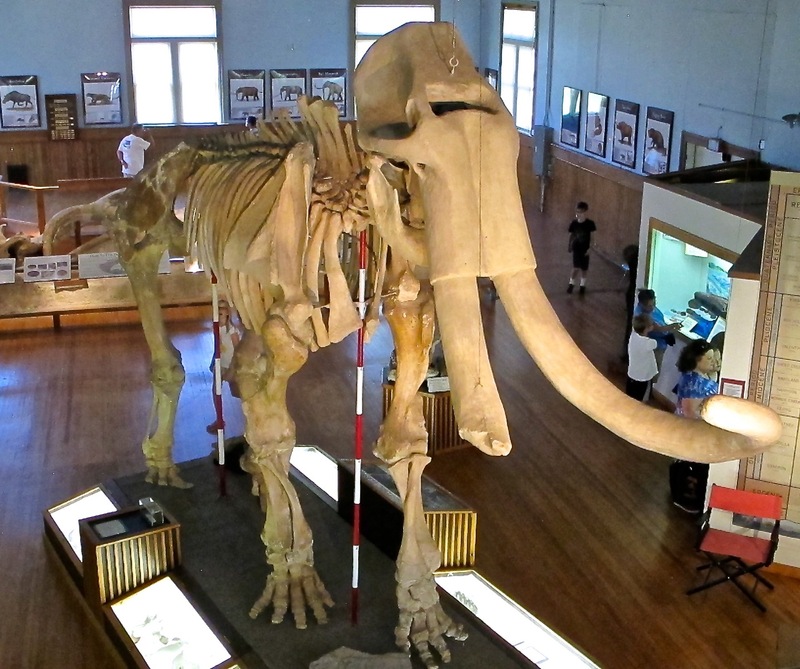 Sixty-One and counting – the number of individual mammoths (58 Columbian and 3 woolly) found at this site in Hot Springs, South Dakota. Covered for 26,000 years the first bones were exposed in 1974 as the the land was being excavated for a housing development. Time for Plan B. Today a climate-controlled building covers the massive collection of Ice Age fossils in-situ (left in place, as they were found). A visit to Mammoth Site starts with a 7-minute video explaining how this occurred. A spring-fed sinkhole became a death trap for mammoths, camels, llamas, giant short-faced bear, wolves, coyotes and more. The sinkhole banks would give way as animals fed around the rim, after falling in they were unable to climb up the steep sides. Work continues on the “dig”. Jr. and Advanced Paleontology Programs offer hands-on experiences (advanced registration required). Earthwatch and Road Scholar programs provide more intensive volunteer experiences. The 30-minute tour around the sinkhole is narrated by guides. 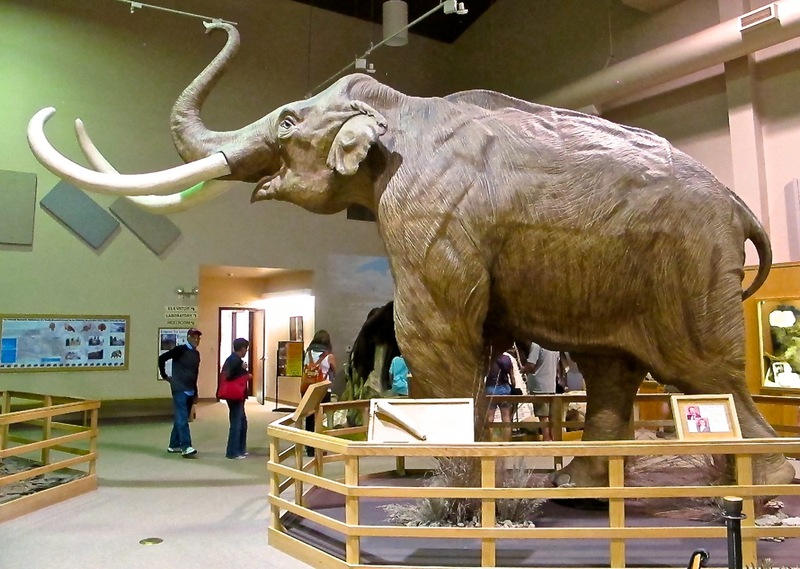 After the tour visitors can spend more time observing the site or enter the Exhibit Hall featuring full-sized replicas of mammoths. We found the exhibits and explanations wide ranging and well done. 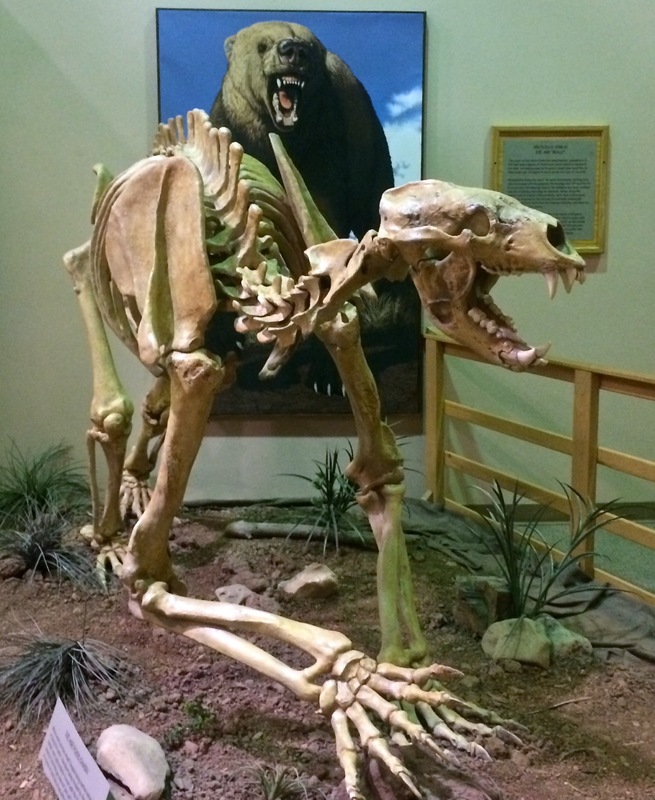 A painting of a giant short-face bear hangs behind the assembled skeleton helping us image meeting the long-gone mammal coming down the trail. No thanks! 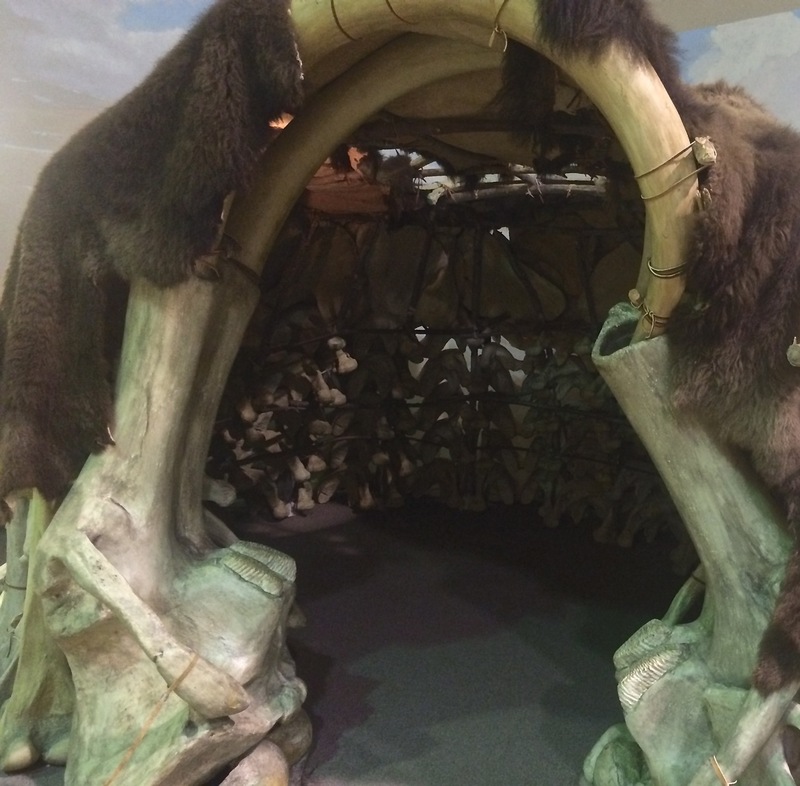 I was intrigued with the replica of a mammoth bone house, similar to ones found in the plains of Ukraine, Poland and Czech Republic. Some of the dwellings date to 27,500 years ago, about the same period as activity at the Mammoth Site sinkhole. This replica is constructed of 121 mammoth bone castings including 74 jaws and covered with eight bison hides. 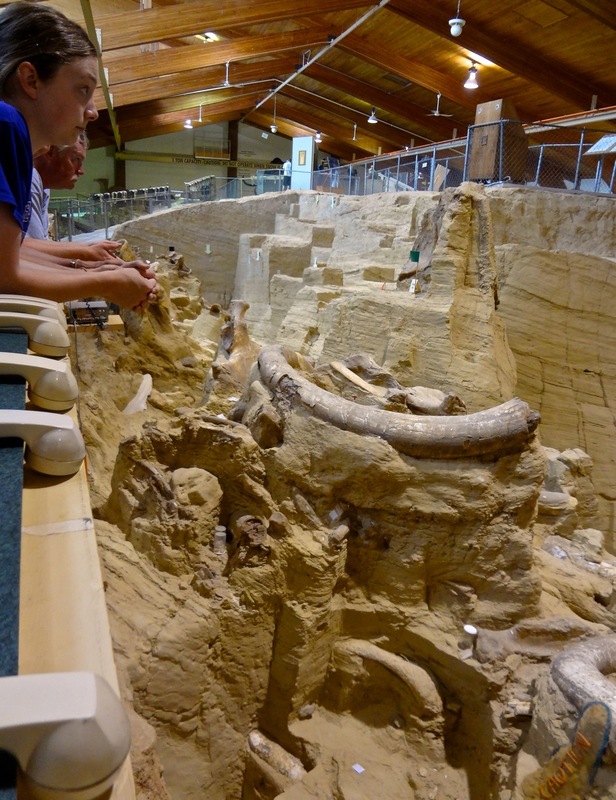 Video, tour, exhibits – we spent twice the amount of time we expected, finding Mammoth Site worth every minute. 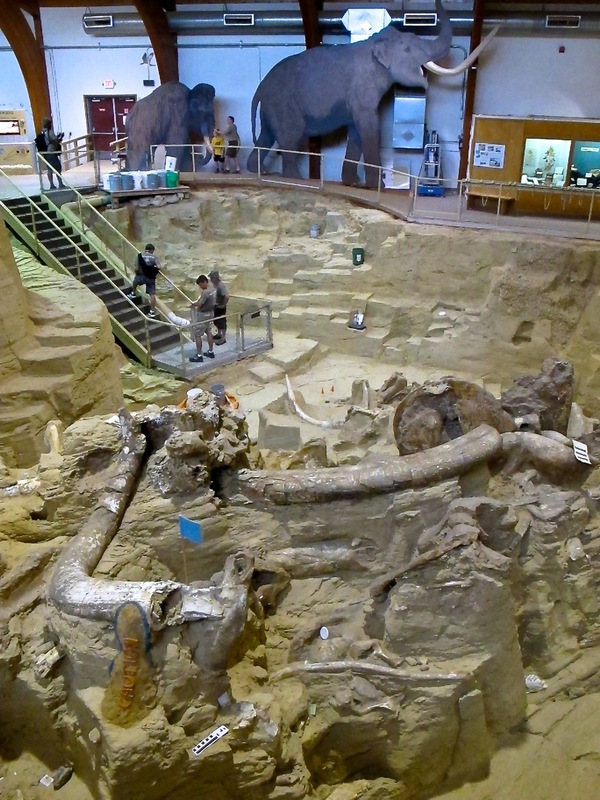 When You Go: Mammoth Site – 1800 US18 Bypass, Hot Springs, SD, 605-745-6017, http://mammothsite.com. 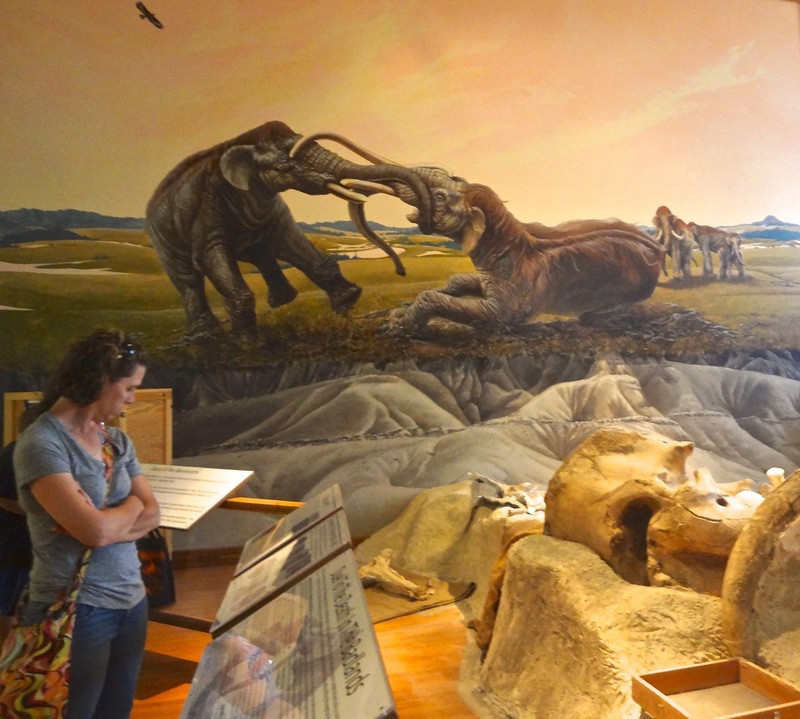 A mural depicts a “Clash of the Titans,” two massive, bull Columbian mammoth locked in battle. On display in front of the mural are the actual skulls and tusks still interlocked, more than 10,000 years later. The site is Nebraska’s Little Badlands in the extreme northwest corner of the state. 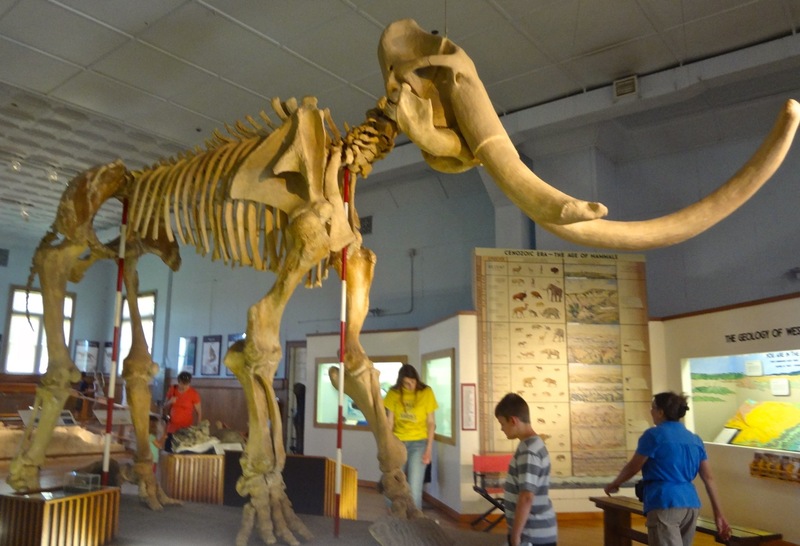 The fossils were uncovered in Dawes County in the summer of 1962; today they’re on display at the Trailside Museum of Natural History in Ft. Robinson State Park. Research tells us that the two mammoths were both males about 40 years old and the battle probably occurred in the spring mating season when testrostrone levels were high. Both of the combatants had one previously broken tusk which enabled them to use the other as a saber. At some point in the battle the tusks become entangled and the two fought until one fell dragging the other down. Unable to regain footage the “mating game” led to their deaths. There they laid from the ice age until the 20th Century. 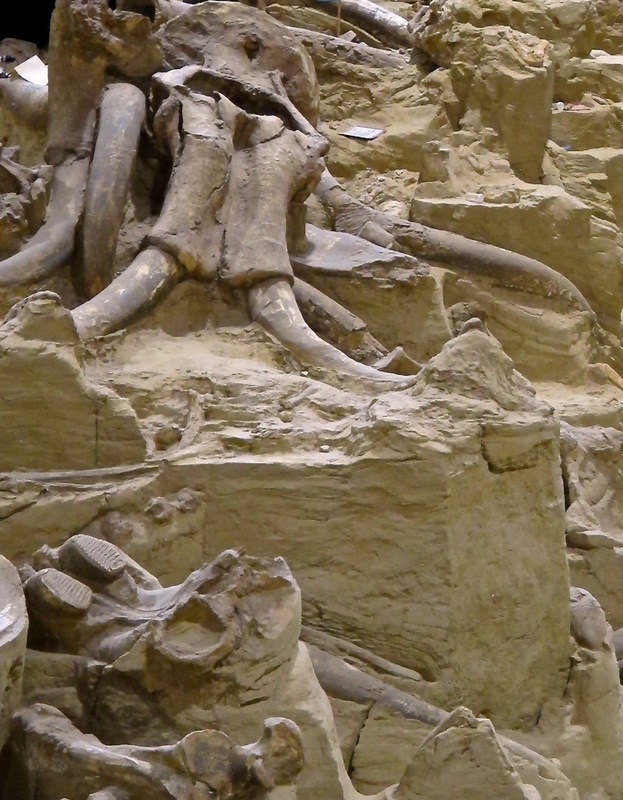 This dramatic display contains some of the rarest of fossil finds – internaitonal treasures. As we enter the University of Nebraska affiliated museum the skeletal remains of one of the mammoths (with casted skull and tusks) gives us an amazing view of how large these mammals were. While the museum is not large it is packed with quality displays and information. The volunteers when we visited were real knowledgable assets for visitors. Other fossils found in Nebraska on display are an ancient rhino, giant tortoise and a mosasaur skull. When visiting be sure to take the stairs to the balcony for an overview of the full-standing mammoth. When You Go: Trailside Museum of Natural History at Ft. Robinson State Park, 3 miles west of Crawford, NE, 308-665-2929, www.trailside.unl.edu. Pulling into the parking lot of the Museum of the Fur Trade I had my doubts. Was this worth the time and admission fee? The sign, building and nearly empty parking lot did nothing to entice but we had driven out of our way to get there so felt compelled to pay a visit. I’m so glad we did. 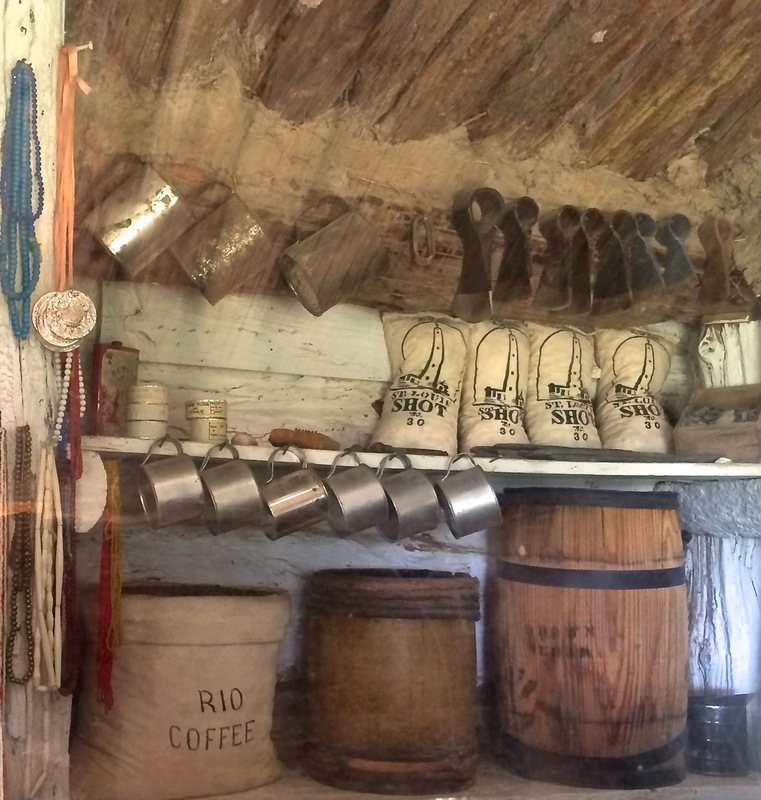 The museum is filled with artifacts telling the story of the North American fur trade economy. Decades before any gold rush, trappers and traders followed water routes into the continent’s interior seeking furs which were in demand in Europe and the Eastern US. A short video, played upon request, sets background for a museum visit. While not all the displays are exhibited to their best advantage the quality of the collections are without question. 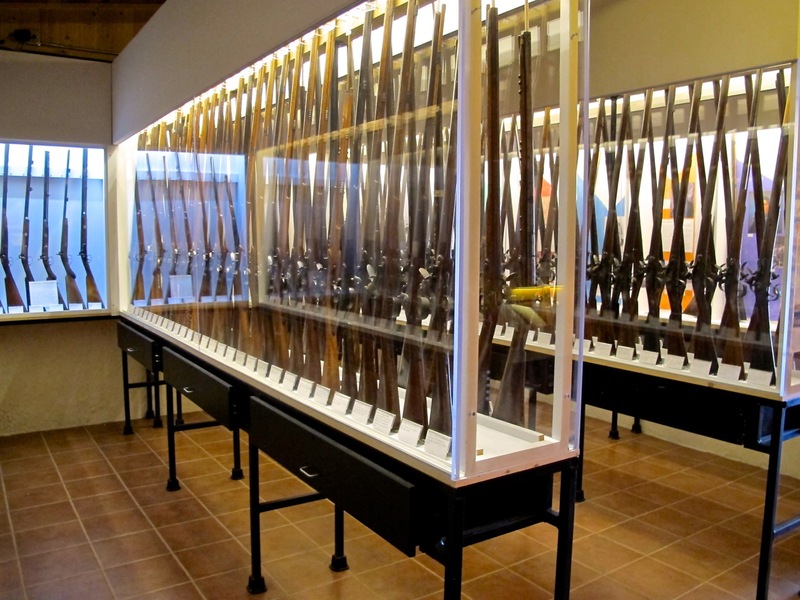 My husband was impressed with the firearms collection focusing on guns made for trade with the Indians, known as North West Guns. I found the textile room particularly impressive and comprehensive; including a 1775 point blanket, 19th-century Navajo chief blankets, Rio Grande serapes and calicos – popular trade cloth with the native population. 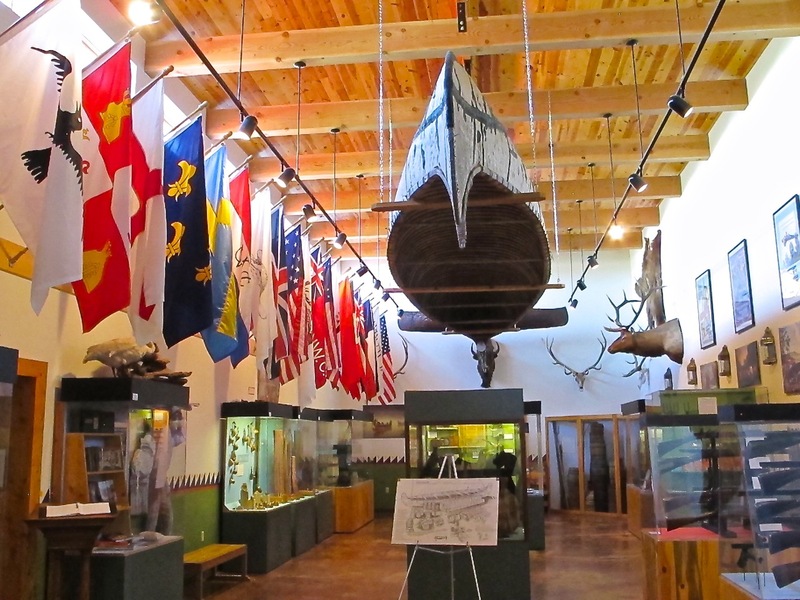 The museum is built on the site of James Bordeaux’s trading post established for the American Fur Company in 1837. A reconstructed post built on the original foundation is recognized on the National Registry of Historic Places. 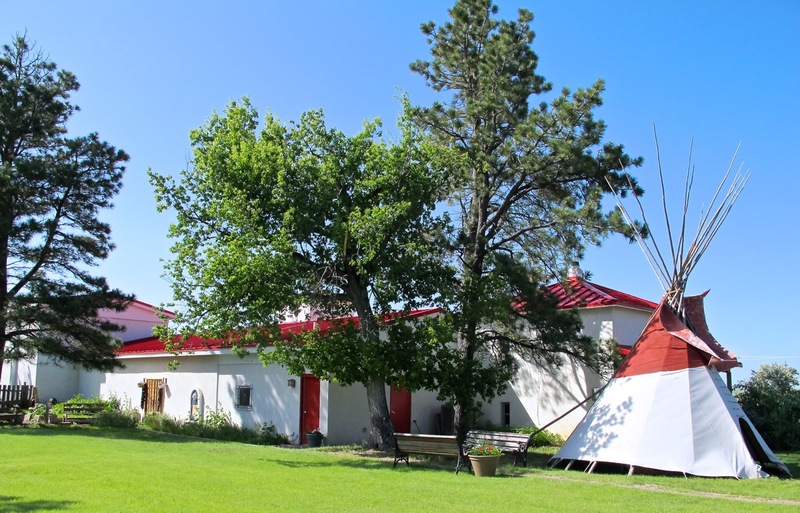 A short path circles past the trading post (stocked with typical trade goods of the period), a storeroom, fur press and red-topped tipis symbolizing the Sioux who camped here when they came to trade. Gardeners will find the Heirloom Indian Garden with plantings of midget Mandan tobacco, Assiniboin flint corn and Arikara watermelon of interest. Any surplus seeds are available for purchase. The gift shop was another pleasant surprise with the quality and variety of authentic wares. There was a rare carved Patty Fawn bracelet I had a hard time passing up even though it didn’t fit. 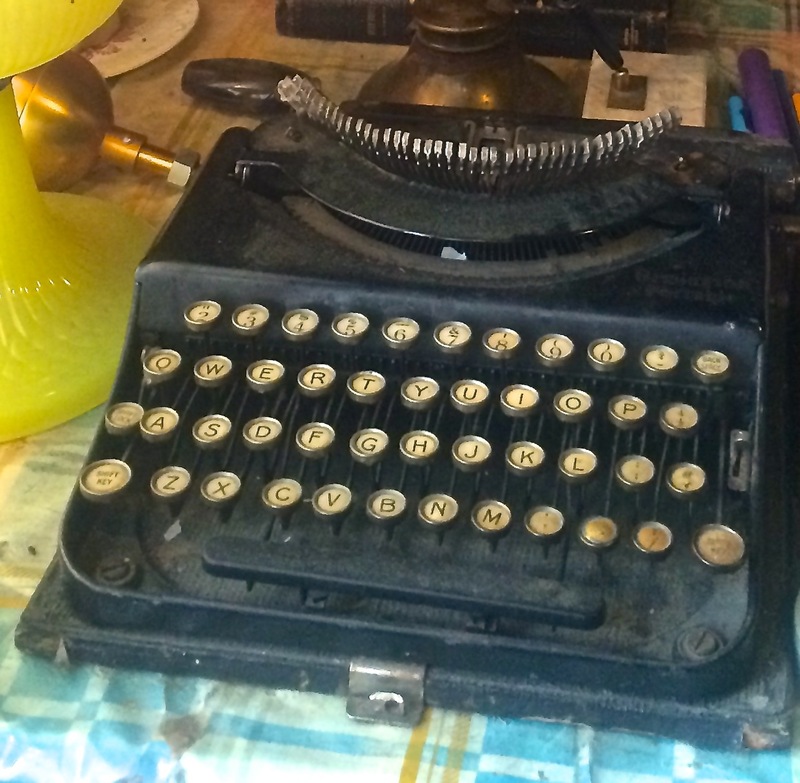 I have since noted that many items are available to purchase online, a resource to remember. The book selection on all related subjects is extensive. Was it worth it? Let’s just say we were there until closing and I would go back in a heartbeat. 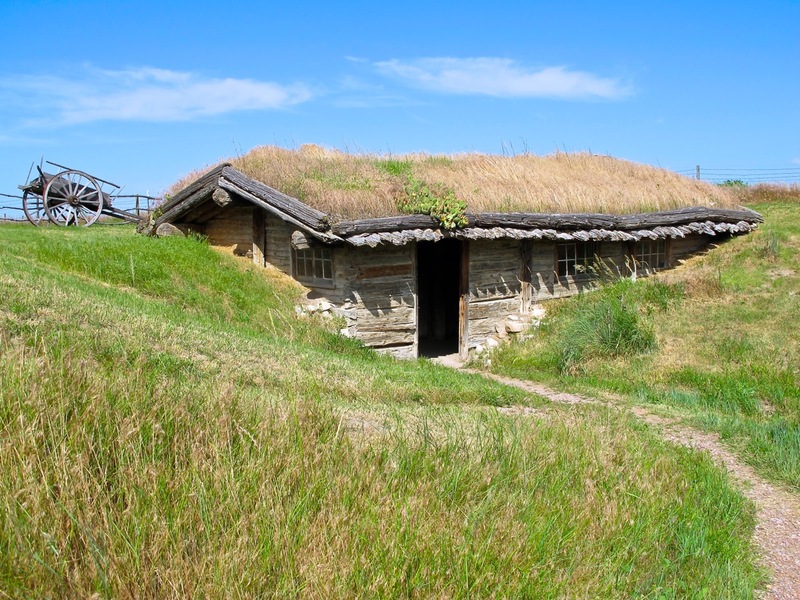 When You Go: Museum of the Fur Trade, located 3 miles east of Chadron, Nebraska on US Highway 20, http://www.furtrade.org.